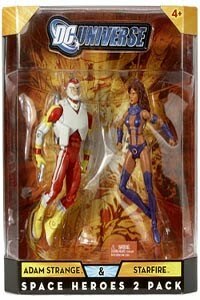 DC Universe™ Classics 2- Pack: Adam Strange™ and Starfire™ - Coming this fall! Complete your DCU Classics collection with this Adam Strange™ and Starfire™ 2-pack! The hero of Rann™ and the beautiful princess of Tamaran will soon be available as highly detailed, highly articulated 6" action figures from Mattel. Pack includes Adam's trademark space pistol. Available in beautiful window box packaging perfect for display. Coming this fall to MattyCollector.com. While supplies last!